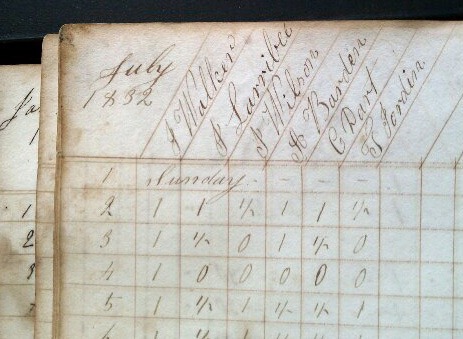 In this day book from Crane’s Old Stone Mill, you will see that Crane was making “Tellegraph” paper beginning in July of 1832. History tells us that Samuel Morse invented the electromagnetic telegraph in 1847, so why telegraph paper 15 years earlier? History also tells us that Harrison G. Dyer in 1826 first started work in Concord, Mass., on sending messages over a single wire via electrical impulses that would leave a distinctive mark on chemically treated paper. The first telegraphic message was sent over 18 miles of wire at a racetrack on Long Island. A bitter fight over royalties caused him stop his work and leave for Paris at a date unknown. So, was Crane making telegraph paper for Harrison Dyar? Or was there something else going on? I’ll be heading to Concord soon and will report my findings.